Largest fast-food chain to take credit and debit cards to satisfy customer demands for perks. NEW YORK (CNN/Money) - McDonald's Corp. will soon accept credit and debit cards for payments at restaurants across the United States, a spokesman confirmed to CNNfn Tuesday. 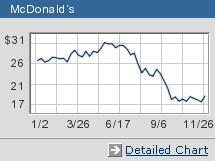 McDonald's (MCD: up $0.04 to $18.27, Research, Estimates) stock was little changed after the news. The nation's largest restaurant chain will start accepting payment by credit card by mid-2003, according to spokesman Bill Whitman. "We are not prepared to say where it will start, but it will be in markets where it makes sense." Whitman said that McDonald's has tested various other sales techniques over the past 16-to-18 months, including a Chicago-area test with a speed pass device that a customer could swipe at a register and a West Coast test with a transponder that would record sales from cars using drive-through windows. He added that when the company plans to accept credit, it will most likely be through credit cards or debit card purchases, however. McDonald's franchisees, who operate about 80 percent of the 13,337 locations, support the credit plans, but they will incur some cost to adopt the system, Whitman said. The company's move to plastic comes in response to customers who don't want to carry cash and who want to receive frequent flier miles or other perks that come with credit- or debit-card purchases, according to a report in the Wall Street Journal. Concerns about slowing up the payment process have stopped McDonald's from accepting plastic, but improved high-speed connections allow card purchases to be faster than cash payments, about five seconds a purchase, compared with 8-to-10 seconds for cash, the paper reported. Customers will not be required to sign for the purchase, just as at many gas stations that now allow credit and debit purchases without a signature. The relatively low cost of a McDonald's meal makes the risk of stolen cards being used less likely, according to the Journal. Subway, the closely held sandwich chain that is second to McDonald's based on number of stores, already accepts plastic at about half its locations, while Yum! Brands Inc. (YUM: Research, Estimates) started accepting cards at its KFC and Long John Silver's locations last year. Burger King, the No. 2 U.S. burger chain owned by Diageo PLC (DEO: Research, Estimates), and No. 3 Wendy's International Inc. (WEN: Research, Estimates) also are testing using charge cards, the report said.